Parking lot maintenance includes expert service for striping. Fresh and sharp striping makes your parking lot aesthetically pleasingly and your property look fantastic in general. The exterior of your business is the first thing people notice. So make sure your parking lot striping is done by the prompt and courteous professionals at PaveMaster. 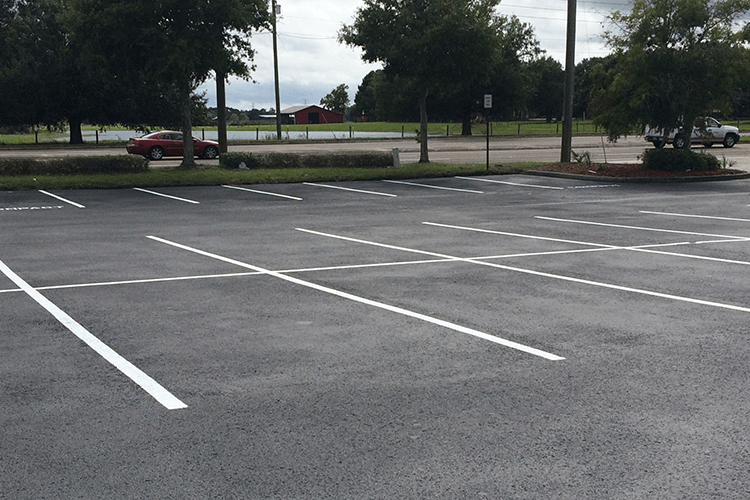 We assist parking lot owners throughout the Tampa Bay Area with their striping, compliance, and maintenance needs. What sets us apart from the competition is our commitment to quality customer service and getting the job done with as little disruption to the flow of traffic to your business as possible. Although we use high-quality paint that dries quickly after application, we know that every minute counts and we work with your schedule so that the job is done with little disturbance to you or your customers. Since our striping services require a lot clear of people and cars, we want to work with you to find a time where your parking lot is not very business. Usually, this means working outside of your normal business hours or scheduling multiple trips to work on your lot in sections. No parking lot striping is too big or small. From small commercial parking lots to large properties, we can handle any sized job and get you the optimum amount of parking stalls. Pavemaster provides quality service at the best price around because we are a small family-owned business that puts our customers above all else. If you are in need of striping services, contact us today. You can count on us to get the job done and promptly.